All Pravins jewellery is made to the highest standards and is designed to be worn and enjoyed. Although your jewellery is made of hard and durable materials, it is still delicate and easily damaged. Therefore all jewellery should be worn with a reasonable amount of care and stored responsibly when not being worn. We have listed below some important information to help you understand the best ways to care for and protect your jewellery. If you have further queries or require assistance, our boutique staff will be delighted to help. Wear and tear (also referred to simply as ‘wear’) refers to deterioration of the aesthetics or function of your jewellery caused by regular use. Virtually all jewellery will experience some level of wear, depending on how frequently it is worn and how much contact it receives. Rings, bracelets and bangles usually receive more contact than other types of jewellery. The most common examples of wear and tear are scratching and denting of surface finishes and deterioration of small parts such as fastenings and claw settings. Wear and tear is not indicative of a fault and is therefore not covered by the Pravins guarantee. One way to monitor wear and tear on your jewellery is to utilise our annual inspection service. The best way to look after your jewellery and minimise wear is to be mindful when wearing it and also to have it inspected by Pravins at least once a year. These complimentary inspections allow us to professionally clean your jewellery and then perform detailed checks to ensure that settings and fastenings are secure and that your gemstones and metal are in good condition. Pravins have decades of experience of dealing with fine jewellery and we are familiar with the visual clues that may highlight the need for maintenance or an increased level of care. Ensuring that your jewellery is inspected and maintained on a regular basis will significantly reduce the risk of unexpected problems and will also serve as a useful record in assessing any claim under the guarantee. On the following pages we have provided more detailed guidance on caring for and maintaining different types of jewellery. Please do not hesitate to contact Pravins if you require further assistance, our details can be found at www.pravins.co.uk. Earrings usually contain small and delicate parts and therefore require particular attention. Earrings should always be removed for activities where there is a possibility of damage, such as bathing, showering or sleeping. Please also take care when brushing or combing your hair as earrings can easily get caught. When removing earrings grip the earring stem behind the front motif or gemstone with one hand before carefully pulling off the earring back with the other. Do not pull the earring off from the front as this can damage the earring if pulled too hard. Pearls are normally secured into earrings with adhesive but can come loose if repeatedly pulled when being removed. Over time re-attachment of pearls into stud earrings should be expected as routine maintenance, however the span between maintenance visits can be lengthened by careful handling and using the correct removal technique. Butterfly or scroll earring backs can loosen over time. Backs should show some resistance when being pushed on or pulled off; if they move too easily they are not secure. On the other hand if they are too stiff making them difficult to remove please visit a boutique and we can adjust them for you. Please do not attempt to adjust earring backs at home as they are easily damaged. Pravins also offer alternative earring backs such as lockable alpha backs. Some heavier earrings are offered with alpha backs as standard as they are very secure, however please enquire with a member of the boutique team if you want to explore alternative earring fittings for your jewellery. Pravins stock a range of replacement earring backs in a variety of sizes. When securing hoops make sure the fastenings are lined up before clicking them into place as forcing them in the wrong direction could damage hinges and not securing them correctly could cause them to come loose. The majority of Pravins hoop earrings will be hollow even though they appear to be solid, this helps reduce their overall weight making them easier to wear. Extra care should be taken with hollow jewellery as a knock may result in irreversible damage. All gemstone settings will require periodic maintenance work in order to maintain security and prevent lost gemstones. The best way to detect and minimise the risk of gemstone and setting damage is through regular inspections as well as being mindful of the risks. Please refer to the Gemstones section of this booklet for further advice on how to care for and maintain your specific gemstones. If your earrings are set with pearls please pay particular attention to the advice on pearls. Whenever possible try to store your earrings in their original boxes. If this is not possible, try to keep each earring separate in order to avoid scratching. Always put your earrings down onto a soft surface for example a Pravins jewellery cloth. When travelling, we would recommend each earring is stored in an individual sleeve such as a Pravins jewellery pouch. Earring backs are easily lost so always place them back onto the posts when not wearing the earrings. Like rings, bracelets and bangles are more susceptible to being caught or knocked than jewellery worn around the face or neck. Pravins recommend that you remove all wristwear before engaging in any activity that could cause damage. It is not possible for us to comprehensively list or be aware of every activity undertaken by our clients and therefore you will need to use your reasonable judgement to determine whether there is a risk of damage. Strenuous or manual activities such as gardening or sporting pursuits are obvious examples; however it is also possible to subject your bracelet or bangle to excessive force during everyday activities such as working in an office or around the home. Repetitive impacts of lower intensity can also result in damage over a period of time. The majority of plain gold bangles will be hollow even though they may appear to be solid. Extra care should be taken with all hollow bangles and bracelet links as a knock may result in irreversible damage. Please be aware that wearing several bangles or bracelets together or alongside a watch will significantly increase the risk of damage to one or more of the items. As with chains, try to avoid playing with or pulling on bracelets while wearing them as this can stretch the links. An average bracelet is between eighteen and nineteen centimetres long; if you require a different length please contact our boutique teams as we may be able to alter your current piece of Pravins jewellery. Wearing a bracelet that is the incorrect size could increase the risk of damage. Try to familiarise yourself with how the clasp on your bracelet or bangle works and feels so you may be aware of any changes with its security. Additional safety chains can be fitted to some items for added reassurance. Please refer to the Gemstones section of this booklet for further advice on how to care for and maintain your specific gemstones. If your bracelet is set with pearls please pay particular attention to the advice on pearls. Most bracelets and bangles can be permanently kinked, bent or dented if not stored correctly. Where possible store your jewellery in original Pravins boxes and avoid tangling bracelets together. When travelling, we would recommend bracelets and bangles are stored in individual sleeves such as a Pravins jewellery pouch. Jewellery worn around the neck is easily caught and should be worn with care. Remember to remove chains, pendants and necklaces when carrying out physical activities such as sporting pursuits and when bathing, showering or sleeping. Try to refrain from handling necklaces while being worn as this can increase the risk of stretching or loose links. Certain styles of necklace will need extra care when being stored at home or travelling. In particular snake chains will need to be stored carefully in the original box in order to reduce the risk of irreversible kinks. Some necklaces have a fine texture or finish to them, please take care when wearing these with high-necked items of clothing or fluffy garments as clothing fibres can get caught in the jewellery and be difficult to remove. It is not unusual for chains to shift or twist whilst being worn and from time to time you might find your clasp ends up at the front of your neck; if you find this is a persistent problem it may be possible to solder your pendant in a fixed position on the chain. Try to familiarise yourself with how the clasp on your necklace works and feels so you may be aware of any changes with its security. Additional safety chains can be fitted to some necklaces for added reassurance. Over time delicate or decorative solder joints can wear down and the bails of free-running pendants can become thin. These effects are classed as wear and tear and would not be covered by the Pravins guarantee. Please refer to the Gemstones section of this booklet for further advice on how to care for and maintain your specific gemstones. If your pendant or necklace is set with pearls please pay particular attention to the advice on pearls. Some chain and necklace styles can permanently kink or bend if not stored correctly. Where possible store your necklaces in their original Pravins boxes, avoid tangling chains together and if hanging them on a jewellery tree keep them a good distance from one another. When travelling, we would recommend necklaces are stored in individual sleeves such as a Pravins jewellery pouch. Pravins have five decades of experience in buying and selecting fine gemstones. We maintain our own gemstone-sorting laboratory and our skilled gemstone experts are steadfast in their constant search for the finest diamonds and gemstones. All gemstones have their own unique properties; please refer to the following guide to help you get to know your gemstone and in particular how to clean and look after it. Pravins strongly recommend that you return to one of our boutiques at least once a year for an inspection of your jewellery. These inspections allow us to professionally clean your jewellery and perform detailed checks to ensure all settings and fastenings are secure. Our staff will also look at the condition of your gemstones and provide advice on any maintenance requirements. A gemstone’s hardness is measured by reference to its score on Moh’s scale of hardness; this scale is presented as numbers one to ten, with ten as the hardest. Moh’s scale is a measure of how resistant the surface of a gemstone is to abrasions. The hardness of a gemstone is an important factor when deciding what type of gemstone to choose. For example, a particularly soft or brittle gemstone will require more care and attention than a harder one and may not be the ideal choice for everyday wear. To be classed as a gemstone the mineral in question must be deemed beautiful, rare and durable. Whilst some gemstones only need to be cut and faceted to reveal their inner beauty, some have been assisted along the way to improve their final appearance. This assistance is known as a gemstone treatment and refers to any process other than cutting and polishing that improves the appearance of a gemstone. Having been carried out in one form or another for centuries, some treatments are considered a continuation of the process of nature. These are known as acceptable treatments and are widely used across the jewellery industry so much so that they do not have to be disclosed and it should be readily assumed these treatments will have occurred. The World Jewellery Confederation (CIBJO) Blue Books are the internationally-recognised reference point for treatment standards for all gemstones. Examples of acceptable treatments include heat treatment and clear oiling or waxing. However, there are some treatments that change the structure or colour of a gem by artificial means and are not permitted, or must be disclosed at the point of sale. Examples of unacceptable treatments include infilling, laser drilling and surface or lattice diffusion. At Pravins our expert buyers and gemmologists meticulously examine thousands of diamonds and gemstones every year and select only the liveliest and most beautiful specimens for our jewellery. Some of these will have undergone accepted treatments but we do not stock gemstones with unaccepted treatments. Please ask a member of staff if you wish to discuss this subject further. Diamond is the hardest gemstone, scoring 10 on Mohs scale. This hardness makes diamond an ideal choice for everyday wear and it has become synonymous with the finest engagement rings. However, contrary to popular belief diamonds are not indestructible and a diamond can be chipped relatively easily if a force is applied at a particular angle. This vulnerability comes from the presence of ‘cleavage planes’ within diamond’s internal atomic structure. Although these cleavage planes allow diamonds to be cut and faceted, they do also create a directional weakness which means if knocked a diamond can chip or even break. If a diamond has one or more large inclusions just under the surface this will affect its structural integrity further. For these reasons, chipped or broken diamonds are not automatically indicative of a fault with your gemstone and any claims under guarantee will require further investigation. Chipping or breaking a diamond that has been set into a piece of jewellery is very rare, however if you are concerned about this happening then an enclosed setting such as a rubover or bezel setting can reduce the risk of damage by protecting the edges. Due to their ability to scratch other gemstones and metals, your diamond pieces should be stored away from other jewellery and individually in their original boxes or pouches. You can clean your diamond jewellery at home by dipping it in a mild soap solution and then rinsing well in clean water. Use a soft toothbrush to gently remove any stubborn debris but be careful not to snag any claw settings. The frequency of home-cleaning will vary depending on individual usage however we would recommend bringing your diamond jewellery into a Pravins boutique at least once a year to take advantage of our complimentary cleaning service. Sapphire and ruby are both from the Corundum family and therefore share many of the same qualities and properties. Scoring 9 on Mohs scale, their durability makes sapphire and ruby an excellent choice for everyday wear and with such a wide variety of sapphire colours available it is no surprise they are sought-after alternatives to diamond for engagement rings. However, just like diamond, they are not indestructible and can be damaged by a sharp knock against a hard object. We recommend your ruby or sapphire jewellery is stored in its original boxes or in individual pouches to avoid contact with other gemstones. Sapphire and ruby jewellery can be cleaned easily at home by dipping it in a mild soap solution and then rinsing well in clean water. Use a soft toothbrush to gently remove any stubborn debris but be careful not to snag any claw settings. The frequency of home-cleaning will vary depending on individual usage however we would recommend bringing your pieces into a Pravins boutique at least once a year to take advantage of our complimentary cleaning service. Emerald is from the Beryl family and has a hardness of 7.5 on Mohs scale. Emeralds are brittle gemstones that are relatively easy to chip or break if knocked, therefore Pravins do not recommend wearing emerald jewellery on a daily basis unless a commensurate level of care can be ensured. Most emeralds have surface-reaching fissures which are visible to the naked eye; to improve their appearance they are usually soaked in clear oil. Avoid washing up or bathing while wearing emeralds as soap detergents may cause the oil to dry out, reducing the lustre and resulting in a dull appearance. We recommend your emerald jewellery is stored in its original boxes or in individual pouches to avoid contact with other gemstones. Emeralds can be cleaned by gently wiping over with a Pravins polishing cloth to remove light dirt and finger prints. Please return your emeralds to a boutique if you require a more in-depth clean. We would recommend bringing your pieces into a Pravins boutique at least once a year to take advantage of our complimentary cleaning service. Pearls come in many different shapes and forms with different names and origins, but all pearls require similar care and attention. Almost all pearl necklaces and bracelets are strung on silk thread which can stretch if exposed to humid conditions. Avoid wearing pearl jewellery in showers and steam rooms and remember to check threads regularly for signs of stretching. Please note that re-stringing may be required every six to twelve months for frequently-worn necklaces and bracelets. Some pearls in earrings, pendants and rings will be secured onto a post using adhesive; this can deteriorate over time and it is not unusual to find that cleaning and re-adhesion is required at intervals. Re-adhesion is a straightforward and inexpensive maintenance task. The span between intervals depends on individual wear patterns and can be prolonged by being careful and gentle with your pearl jewellery (particularly when putting it on and removing it) and avoiding exposing it to water, oils, beauty products and humid conditions. We recommend storing your pearl jewellery in its original boxes or in individual pouches to avoid contact with other gemstones. Pearls are adversely affected by the chemicals found in hairspray, make-up and perfume and therefore pearl jewellery should be the last thing you put on and the first thing you take off. Wiping pearls over with a soft cloth after each wear will help keep them at their best. We would recommend bringing your pieces into a Pravins boutique at least once a year to take advantage of our complimentary cleaning service. From the Zoisite family, tanzanite scores 6.5 on Mohs scale and is a relatively soft and brittle gemstone that is susceptible to chipping or breaking if knocked. Pravins do not recommend tanzanite is worn on a daily basis unless you can ensure a commensurate level of care is taken. To minimise the risk of accidental damage please pay particular attention to removing tanzanite jewellery before taking part in any activity where there is a chance of it being knocked. We recommend storing your tanzanite jewellery in its original boxes or in individual pouches to avoid contact with other gemstones. Tanzanite jewellery can be cleaned easily at home by dipping it in a mild soap solution and then rinsing well in clean water. Use a soft toothbrush to gently remove any stubborn debris but be careful not to snag any claw settings. The frequency of home-cleaning will vary depending on individual usage however we would recommend bringing your pieces into a Pravins boutique at least once a year to take advantage of our complimentary cleaning service. Another member of the Beryl family, aquamarine scores 7.5 on Mohs scale. It is less brittle and fragile than emerald so is more suited to frequent wear, however a reasonable level of care should be taken when wearing aquamarine jewellery, particularly rings. The majority of aquamarines will have been heat treated to enhance their blue tones and further heat can reverse the original treatments. Therefore, take care to avoid exposing your aquamarine to sources of heat such as hot water. We also recommend storing your aquamarine jewellery out of direct sunlight and keeping it in its original boxes or in individual pouches to avoid contact with other gemstones. Aquamarine jewellery can be cleaned easily at home by dipping it in a mild soap solution and then rinsing well in clean water. Use a soft toothbrush to gently remove any stubborn debris but be careful not to snag any claw settings. The frequency of home-cleaning will vary depending on individual usage however we would recommend bringing your pieces into a Pravins boutique at least once a year to take advantage of our complimentary cleaning service. Tourmaline is available in an assortment of colours and scores 7.5 on Mohs scale making it suitable for wearing in most types of jewellery on a frequent basis. However, a reasonable level of care should be taken when wearing tourmaline pieces, particularly rings. We recommend your tourmaline jewellery is stored in its original boxes or in individual pouches to avoid contact with other gemstones. Tourmaline jewellery can be cleaned easily at home by dipping it in a mild soap solution and then rinsing well in clean water. Use a soft toothbrush to gently remove any stubborn debris but be careful not to snag any claw settings. The frequency of home-cleaning will vary depending on individual usage however we would recommend bringing your pieces into a Pravins boutique at least once a year to take advantage of our complimentary cleaning service. Garnet is available in a wide variety of colours and scores between 6.5 and 7.5 on Mohs scale making it suitable for wearing in most types of jewellery on a frequent basis providing a reasonable level of care is taken. We recommend your garnet jewellery is stored in its original boxes or in individual pouches to avoid contact with other gemstones. Garnet jewellery can be cleaned easily at home by dipping it in a mild soap solution and then rinsing well in clean water. Use a soft toothbrush to gently remove any stubborn debris but be careful not to snag any claw settings. The frequency of home-cleaning will vary depending on individual usage however we would recommend bringing your pieces into a Pravins boutique at least once a year to take advantage of our complimentary cleaning service. Scoring 6.5 on Mohs scale, peridot is well suited to pendants and earrings and will require a commensurate level of care if set into a ring or bracelet. Peridot’s beautiful olive green colour is often enhanced by heat treatment and clear oiling. You should therefore avoid washing up or bathing while wearing peridot as soaps and detergents may cause the oil to dry out, reducing the lustre and resulting in a dull appearance. We recommend your peridot jewellery is stored in its original boxes or in individual pouches to avoid contact with other gemstones. Peridot can be cleaned by gently wiping over with a Pravins polishing cloth to remove light dirt and finger prints. Please return your peridot pieces to a Pravins boutique if you require a more in-depth clean. We would recommend bringing your pieces into a boutique at least once a year to take advantage of our complimentary cleaning service. Topaz and spinel are available in a wide variety of colours and score 8 on Mohs scale making them suitable for wearing in most types of jewellery on a frequent basis providing a reasonable level of care is taken. Topaz can be prone to fading in colour if exposed to strong light so should be stored in its original box and not left in direct sunlight for prolonged periods of time. We also recommend storing topaz and spinel jewellery in its original boxes or in individual pouches to avoid contact with other gemstones. Topaz and spinel jewellery can be cleaned easily at home by dipping it in a mild soap solution and then rinsing well in clean water. Use a soft toothbrush to gently remove any stubborn debris but be careful not to snag any claw settings. The frequency of home-cleaning will vary depending on individual usage however we would recommend bringing your pieces into a Pravins boutique at least once a year to take advantage of our complimentary cleaning service. Both members of the Quartz family, amethyst and citrine score 7 on Mohs scale making them suitable for wearing in most types of jewellery on a frequent basis providing a reasonable level of care is taken. Avoid exposing your amethyst or citrine to extreme temperatures such as hot water or long term exposure to direct sunlight. The majority of these gemstones will have been heat treated to enhance their colour and such heat can reverse the original treatments. We recommend storing your amethyst and citrine jewellery out of direct sunlight in its original boxes or in individual pouches to avoid contact with other gemstones which may result in damage to your pieces. Quartz jewellery can be cleaned easily at home by dipping it in a mild soap solution and then rinsing well in clean water. Use a soft toothbrush to gently remove any stubborn debris but be careful not to snag any claw settings. The frequency of home-cleaning will vary depending on individual usage however we would recommend bringing your pieces into our boutiques at least once a year to take advantage of our complimentary cleaning service. Morganite is part of the Beryl family and scores between 7.5 and 8 on Mohs scale making it suitable for wearing in most types of jewellery on a frequent basis providing a reasonable level of care is taken. Avoid exposing your morganite to extreme temperatures such as hot water or long term exposure to direct sunlight. Morganite is routinely heat treated to enhance its delicate pink colour and remove any yellow tones which can decrease its desirability and such heat can reverse the original treatments. We recommend storing your morganite jewellery out of direct sunlight in its original boxes or in individual pouches to avoid contact with other gemstones. Morganite jewellery can be cleaned easily at home by dipping it in a mild soap solution and then rinsing well in clean water. Use a soft toothbrush to gently remove any stubborn debris but be careful not to snag any claw settings. The frequency of home-cleaning will vary depending on individual usage however we would recommend bringing your pieces into a Pravins boutique at least once a year to take advantage of our complimentary cleaning service. From the Spodumene family, kunzite scores 6.5 to 7 on Mohs scale making it more suited to pendants and earrings and will require a commensurate level of care if set into a ring or bracelet. Avoid exposing your kunzite to extreme temperatures such as hot water or long term exposure to direct sunlight. Kunzite may be irradiated to enhance its pink tones and heat can reverse these original treatments. We recommend storing your kunzite jewellery out of direct sunlight in its original boxes or in individual pouches to avoid contact with other gemstones. Kunzite jewellery can be cleaned easily at home by dipping it in a mild soap solution and then rinsing well in clean water. Use a soft toothbrush to gently remove any stubborn debris but be careful not to snag any claw settings. The frequency of home-cleaning will vary depending on individual usage however we would recommend bringing your pieces into a Pravins boutique at least once a year to take advantage of our complimentary cleaning service. Opals are relatively soft gemstones scoring between 5.5 and 6.5 on Mohs scale. They contain a degree of water and are prone to drying out and cracking; they should therefore be kept away from hot, dry conditions such as window sills and radiators. Another delicate gemstone is turquoise, scoring between 5 and 6 on Mohs scale. Turquoise is adversely affected by the chemicals found in hairspray, make-up and perfume and should therefore be the last thing you put on and the first thing you take off. We recommend storing your opal or turquoise pieces out of direct sunlight in their original boxes or in individual pouches to avoid contact with other gemstones. These gemstones can be cleaned by gently wiping over with a Pravins polishing cloth to remove light dirt and finger prints. Please return your opal or turquoise jewellery to a Pravins boutique if you require a more in-depth clean. We would recommend bringing your pieces into a boutique at least once a year to take advantage of our complimentary cleaning service. Rings usually require more care, inspections and maintenance than other types of jewellery because they are the most likely to come into frequent contact with objects and surfaces. Pravins recommend that you remove all rings before engaging in any activity that could cause damage. It is not possible for us to comprehensively list or be aware of every activity undertaken by our clients and therefore you will need to use your reasonable judgement to determine whether there is a risk of damage. Strenuous or manual activities such as gardening or sporting pursuits are obvious examples; however it is also possible to subject your rings to excessive force during everyday activities such as working in an office or around the home. Repetitive impacts of lower intensity can also result in damage over a prolonged period. It is normal for all exposed metal surfaces to show scratches and small dents over a period of time and provided these are not unreasonably deep or numerous they should not cause any further problems. In some cases the pattern of scratches and small dents becomes a surface finish in its own right and is known as a ‘patina’. The band of your ring will naturally be subjected to the highest level of wear, particularly at the base. Some designs of ring can rotate on the finger making them more likely to receive wear and tear evenly over the whole band. Scratches and dents of significant intensity or number appearing within a short period of time after purchase (or refinishing) would be a cause for concern, as would changes in the shape of the band. There are various maintenance options to address surface wear including polishing, brushing, rhodium plating, filing and in some circumstances, replacement of part or all of the band. Please note that these procedures will affect metal thickness and therefore repeated treatment could cause thinning of the band. Surface wear can be minimised by taking care when handling any hard or sharp objects or surfaces. Although we cannot provide an exhaustive list, common examples include metal handrails or door handles, stone worktops, the sharp corners of metal objects (for example filing cabinets) and metal-handled tools or instruments such as keys. If your ring has a surface coating such as rhodium-plating, this will be particularly affected by wear. Please refer to the Metals section of this booklet for more information. All gemstone settings will require periodic maintenance work in order to maintain security and prevent lost gemstones. Gemstones and settings which exhibit scratches and dents would be a cause for concern as this would suggest that the top of the ring has been knocked against other objects, indicating more care is required during wear and storage. The best way to detect and minimise the risk of gemstone and setting damage is through regular inspections as well as being mindful of the risks. Please refer to the Gemstones section of this booklet for further advice on how to care for and maintain your specific gemstones. If your ring is set with pearls please pay particular attention to the advice on pearls. When you buy a ring from Pravins, our sales consultants will be happy to assist you in measuring your finger size to help ensure your new ring is a good fit for you. It is important that your ring fits you well; too big and the band may become misshapen over time, affecting the security of any gemstone settings and increasing the risk of the band cracking or splitting. Too small and the ring will not only be uncomfortable to wear but the strain placed on the ring when being pushed on and pulled off could cause damage to any gemstone settings. It is possible for your finger size to change over time; this is something we would recommend having checked as part of your routine inspection visit to ensure a good fit is maintained. 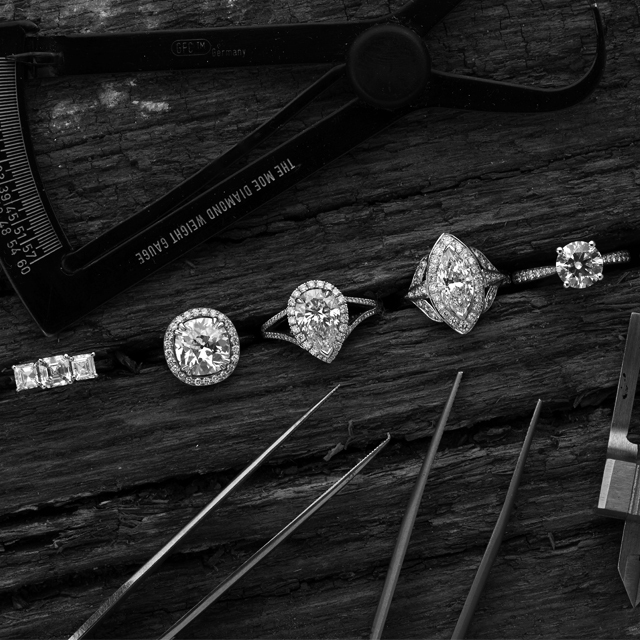 Re-sizing after purchase is not covered by the Pravins guarantee and please bear in mind that it may not be possible to carry out alterations on some styles of ring. Whenever possible try to store your rings in their original boxes. If this is not possible, try to keep each ring separate in order to avoid scratching. Always put your rings down onto a soft surface for example a Pravins jewellery cloth. When travelling, we would recommend each ring is stored in an individual sleeve such as a Pravins jewellery pouch. Precious metal forms the basis of all fine jewellery. The jewellery experts at Pravins work extremely hard to ensure that only the finest quality alloys are used for our jewellery whether 18ct gold, platinum, palladium or silver. Widely used across the jewellery industry, these four precious metals are regarded as having an excellent balance between durability, strength, colour and nobility. Like gemstones, metals need to be cared for and will require maintenance from time to time. All four metals will exhibit surface wear and tear in the form of scratches and dents. In addition, these metals can distort or even crack when placed under strain. When wearing jewellery of different metals together, bear in mind that the softer metal will experience a higher level of wear. Surface scratches and dents can be minimised by taking care when handling any hard or sharp objects or surfaces. Although we cannot provide an exhaustive list, common examples include metal handrails or door handles, stone worktops, the sharp corners of metal objects (for example filing cabinets) and metal-handled tools or instruments such as keys. Surface scratches can usually be polished out; however deeper dents may be harder to remove. Pravins’ staff will inspect the condition of the metal in your jewellery during boutique inspections and will be able to highlight any causes for concern or maintenance requirements. Gold is an amazingly versatile, durable metal which has been used for centuries, so it is no surprise that the vast majority of our jewellery is made using 18ct gold. 18ct gold is denoted by a 750 hallmark, in reference to its 750 parts per thousand fineness. Gold in its pure state is a rich yellow colour, but it can be alloyed with different metals such as palladium and copper in order to create white gold and rose gold. Gold is a more malleable metal than platinum or palladium, but is still suitable for everyday use as long as it is looked after. Over time gold can begin to thin and therefore gold jewellery may need replacing or remounting after many years of wear - this is more common for rings than for other types of jewellery. From the platinum group of metals, both platinum and palladium are naturally white, hypo-allergenic and durable yet also malleable and ductile. Platinum has been used to make jewellery for hundreds of years and is favoured for setting gemstones because of its strength and its ability to be drawn into fine details such as claws. Palladium is far newer on the jewellery scene, having been given its precious metal hallmark as recently as 2009. Despite this it has become a popular choice for wedding rings as it is ideal for everyday wear and requires very little maintenance. While the durability of platinum and palladium makes them excellent choices for jewellery that will receive a high level of wear, this does not mean they are indestructible. Both metals are relatively soft and will scratch and dent when they come into contact with hard or sharp objects. This is particularly common on ring bands, where over time these surface marks can develop into a soft ‘patina’ or lustre. Silver is another highly malleable and ductile metal and and when newly polished it is the brightest of all metals. Although silver resists most acids, it does have an affinity for sulphur. Sulphur in the atmosphere is responsible for the discolouration commonly seen on silver which is known as tarnish. Silver does not tarnish when worn or handled regularly but if left in a jewellery box it will discolour. Tarnish is easy to remove using a silver cloth or silver dip. Do not use old or dirty silver cloths to clean new silver as they can contain grit which will leave fine scratches on new silver. Some silver cloths are also impregnated with abrasive cleaning particles which can scratch highly polished surfaces. 18ct white gold is naturally off-white in colour as it contains a high proportion of gold, which is a yellow metal. To create a bright pure-white finish it is standard practice to electro-plate white gold jewellery with rhodium (a member of the platinum family). Rhodium plating will wear off over a period of time, especially on high-contact items such as rings and bracelets, however re-plating is a simple and inexpensive procedure and will keep your white gold jewellery looking like new. Rhodium plating is not covered by the Pravins guarantee. We would expect to see white gold jewellery returned for re-plating every few years or perhaps for special events. Similarly, special finishes such as sand-blasting, brushing, beaded-edging, patterning and engraving are not permanent alterations and may need to be reapplied over time. There is no hard and fast rule about how long these finishes will last, as this depends entirely on the level of wear the item receives. Bear in mind that marks on a matt or brushed finish can be more noticeable compared to a bright-polished finish. Reapplying special finishes is a simple maintenance procedure and our boutique teams will be happy to talk you through the process.